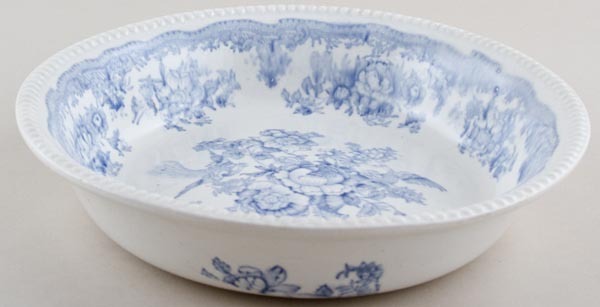 Shallow bowl with white embossed rim, beautifully patterned inside with three snippets of pattern around the outside. Backstamp: Impressed date for 188? Light all over crazing. Inside there is a little roughness to the stilt marks and a couple of minor blemishes and to the outer rim a tiny tiny chip, overall excellent condition. OVERSEAS SHIPPING OUTSIDE EUROPE Owing to the size of this item a supplement of � about US$34 will be added to the standard overseas shipping charge.